Take a grill, leave a grill – REGENERATE ! After we did our experiment we created this concept for reducing the waste of grills. Park goers can leave a grill here instead of throwing it away when it’s no longer needed. This way, other people can continue to use the grill again and again. A small shelter helps to protect the grills from rain. 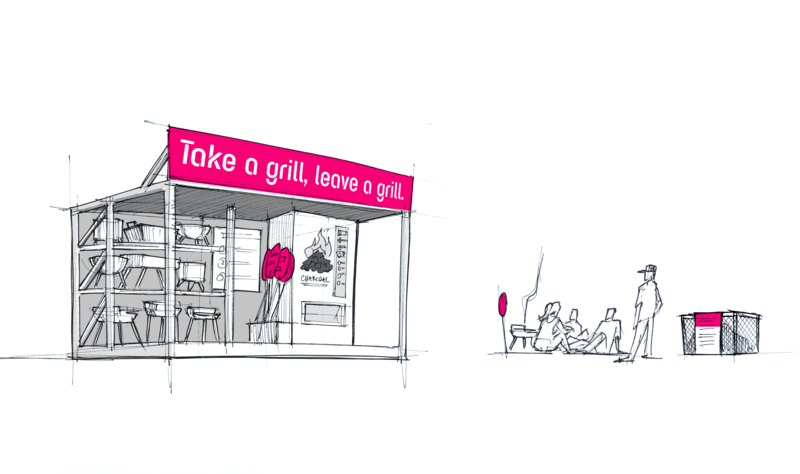 Users are encouraged to take a “Shared grill, join us!” sign. This allows multiple groups to use one grill when all of the grills from the shelter are in use. Opening up the barbecue group through sharing a grill encourages forming new relationships. For added convenience, users can also buy just the right amount of charcoal from a vending machine.